I just couldn’t resist publishing on Valentine’s Day, in honor of all of us who treasure romance in our lives, including me. For those of you who don’t know this yet, the “stars” of my books are always cars. Then there’s my alter-ego “Charlie” who gets IN the car and gets himself into trouble . . . I mean, adventures! My new short story is about a car PART. I know, you’re shaking your head. But I promise it WILL make sense. After all, if you don’t have the parts, you can’t have the car. So this is a back-story Prequel that slides in right before the novel, Book One, The Bootlegger ‘40 Ford, giving you a chance to rev your engine before you take off the main adventure. It’s called The Titanium Camshaft ‘40 Ford. To understand this ingenious part, and what it allows the car to do, you have to follow me into the mind of its inventor, Jerry Price. He was a special kid right from the get-go, interested in all things mechanical, and with the kind of mathematical dexterity and engineering creativity that always had him picturing something that’d never been done before. And now, for the promised explanation of the Romance connection. With Valentine’s Day upon us, let’s step back from gears and grease for a bit and talk about romance in the golden age of the hot rod. That would be the 40s and 50s. So the “news” will be 70 years old. Since about everyone reading this was not around then it can still be called “news” I guess. In that ancient time of which I was a participant, a lot of romance centered around the car. You see we did not have bucket seats and consoles like modern cars. The front seat was a smooth bench seat so the passenger could slide right up next to the driver. Now we know about distracted driving due to “texting”. Try to drive with a young girl with her head on your shoulder and eager for affection. Now that is real distraction. Back to the subject at hand or more correctly “in your hand.” The “necker knob” was an aftermarket device that you clamped to the steering wheel at about the nine o’clock position. It was a ball or similar molded shape that fit the palm of your hand. It was free to revolve around the mount so by grabbing it with one hand it would spin and allow you to turn the steering wheel as far and as fast as necessary. With no date in the seat you could put your pack of Chesterfields in the rolled up sleeve of your tee shirt and drape your arm out the window and casually steer with your left hand on the knob. Now if she was there you kept that arm inside and on the knob while the right hand was otherwise occupied. You must understand that steering was not the only problem there was also the matter of shifting the gears in the transmission. Automatic transmissions were rare and totally nonexistent in a hot rod. You changed gears either with a shift lever stuck in the floor, right in the middle of the floor, or “three on the tree”. It is correctly called a column shift as the shifting mechanism is attached to the steering column and the shift lever sticks out towards the passenger. It is important to understand the shift pattern for reasons more than just driving the car. The pattern is described by the letter “H”. You start off in the lower left with first gear then shift to the upper right for second gear and the straight back to lower right for the high gear. Of particular concern is the second gear to high gear shift where you pull straight back with the floor shift or straight down on the column. In either case your hand is aimed at you passenger’s legs in rather tight quarters. It was often the case that you let the girl do the shifting while you worked the clutch. It occasionally happened that by “accident” if you were doing the second to high shift that your hand would slip off the gear lever and contact the girl’s legs. This could have some dramatic ramifications. To learn more about romance and the 40 Ford I suggest you slide into the topic by reading Titanium Camshaft where you’ll meet Rose. Then take as further study material the second adventure in my book The Bootlegger ’40 Ford. The section has the title. “Moonlight over Lake Seneca.” I try not to blush when I read it. 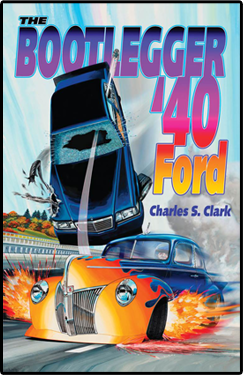 This article was published in Bootlegger Book Blog, Titanium Camshaft and tagged 40 Ford, Charles Clark, hot rodders, hot rods, Titanium Camshaft.